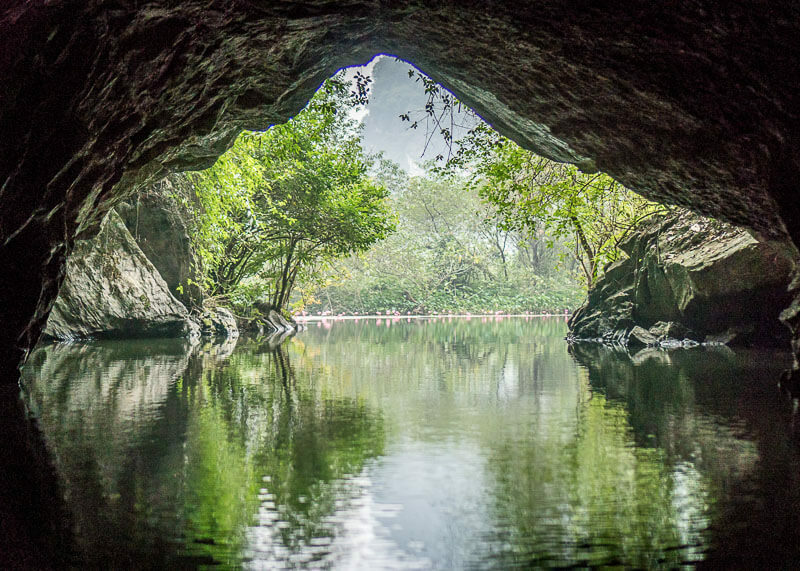 Trang An Grottoes tour is a must do when you are visiting Vietnam! 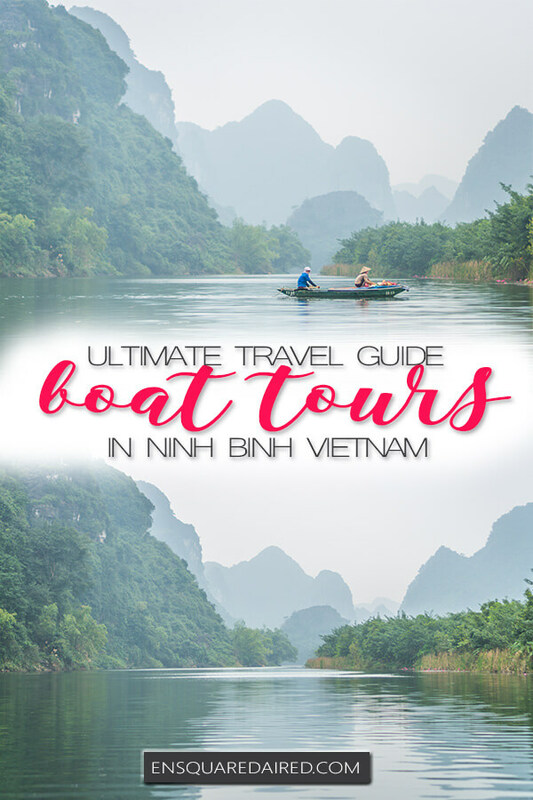 If you are planning a trip to Ninh Binh in Vietnam, there’s a high chance you are going to do a boat tour. 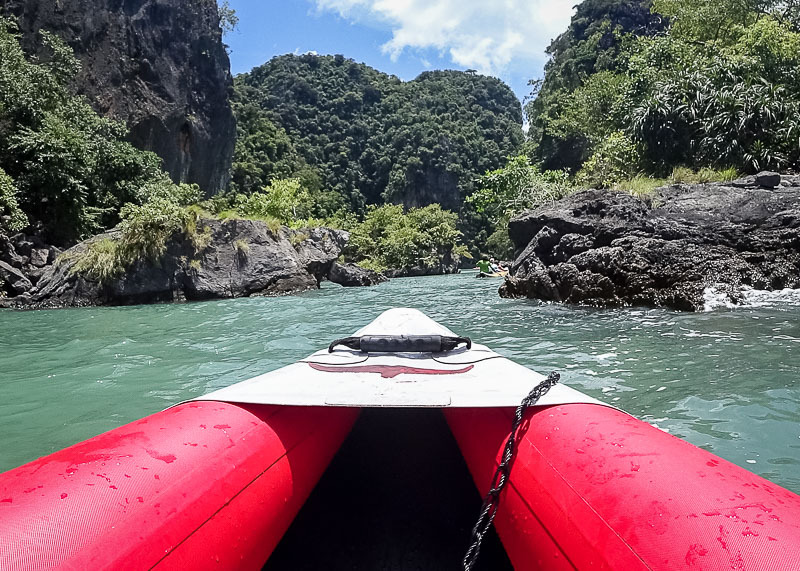 While there are two main tours to choose, this post covers everything you need to know about the Trang An grottoes boat tour. 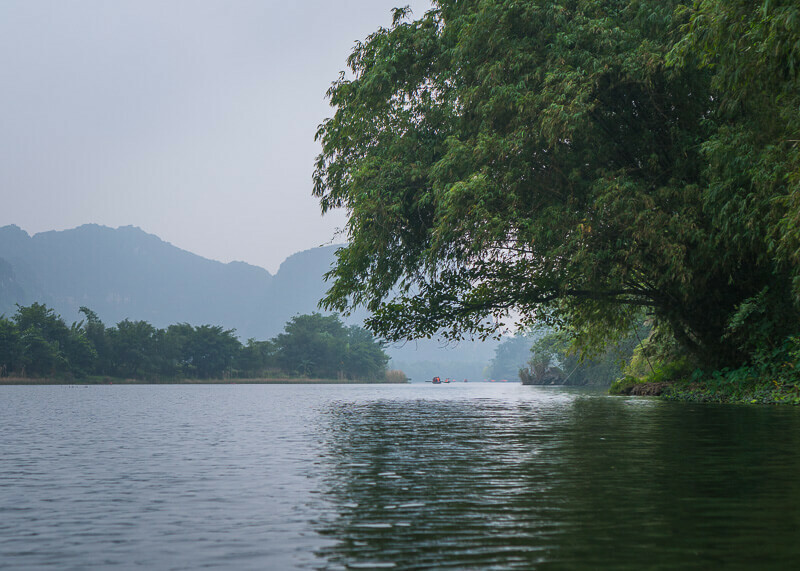 If you want details on the difference between the Tam Coc boat tour and the Trang An boat tour, then keep reading for more information. I built a table to help you make your decision on which tour to choose near the end of this post. 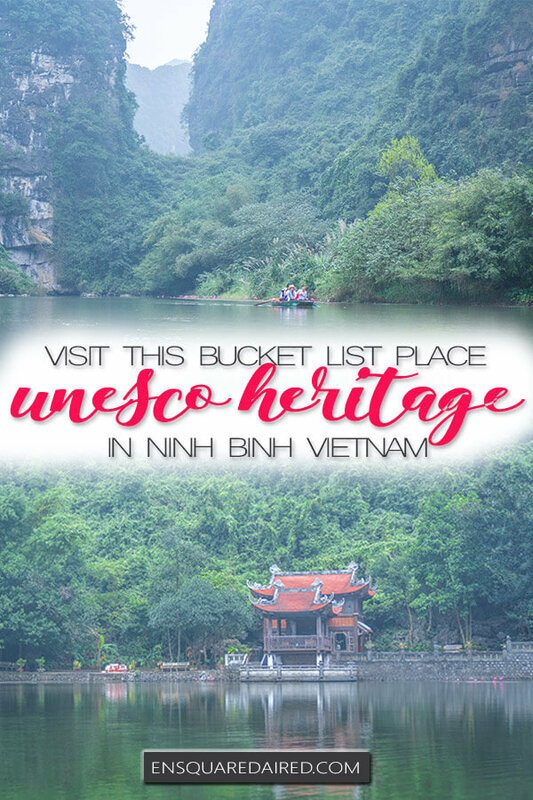 Trang An was recently recognized as a cultural heritage site by UNESCO in 2014. 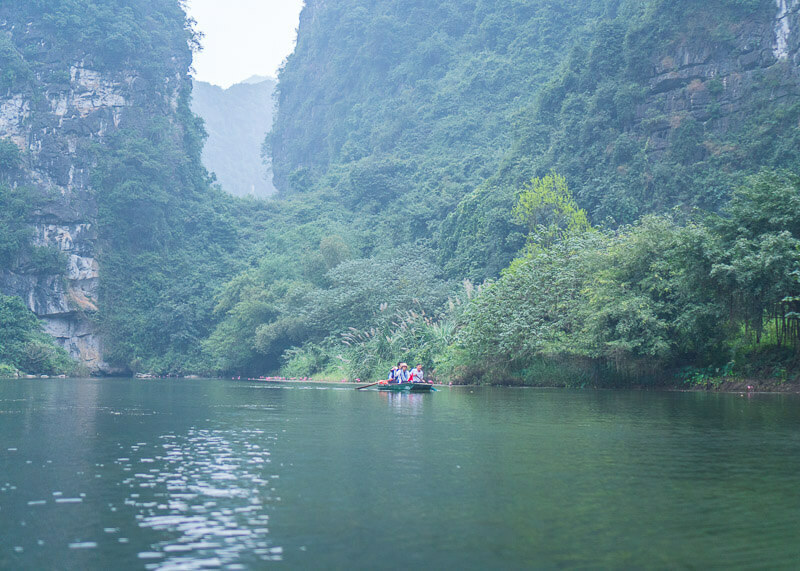 Because most people do not know what to make of Ninh Binh, they often call Trang An grottoes the Ha Long Bay of the land. 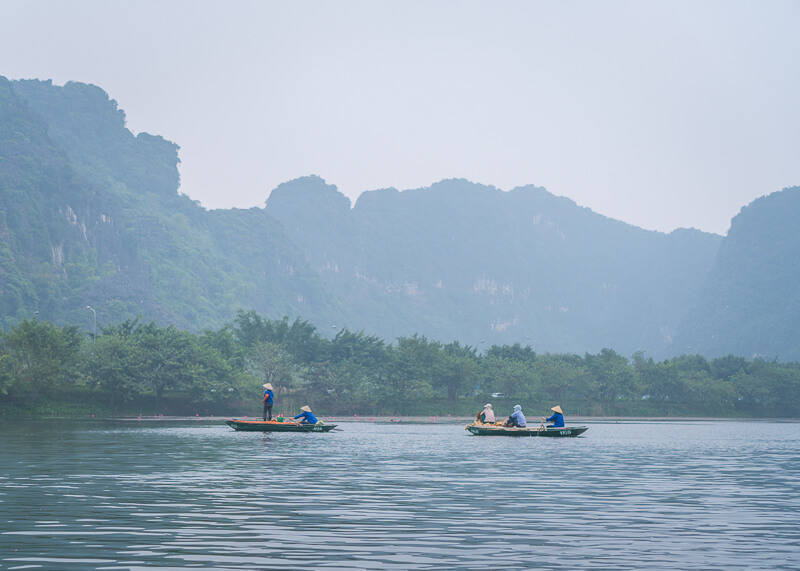 I find it quite funny that people make that reference because Ninh Binh is way better than Ha Long Bay, in my opinion. 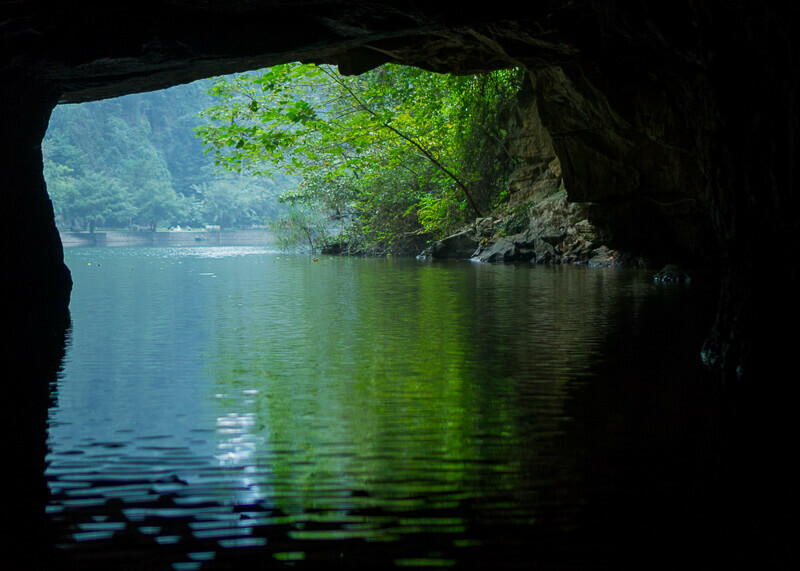 It is Vietnam’s hidden gem if you were to ask me. For starters, Trang An is nowhere near the coast. Instead, beautiful rice paddies connect the mountains. And um, there’s no place for you to sail around the area. 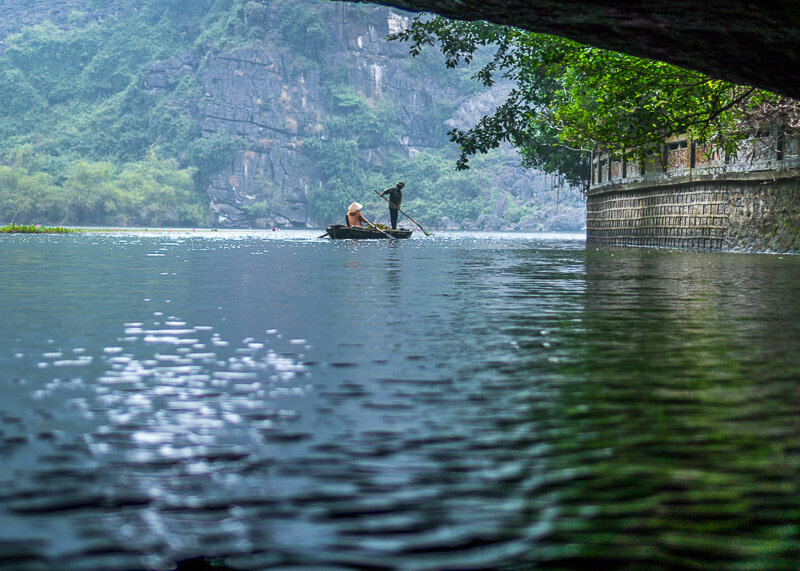 You either get around by bike or take a boat ride to see the beauty of the Trang An grottoes. 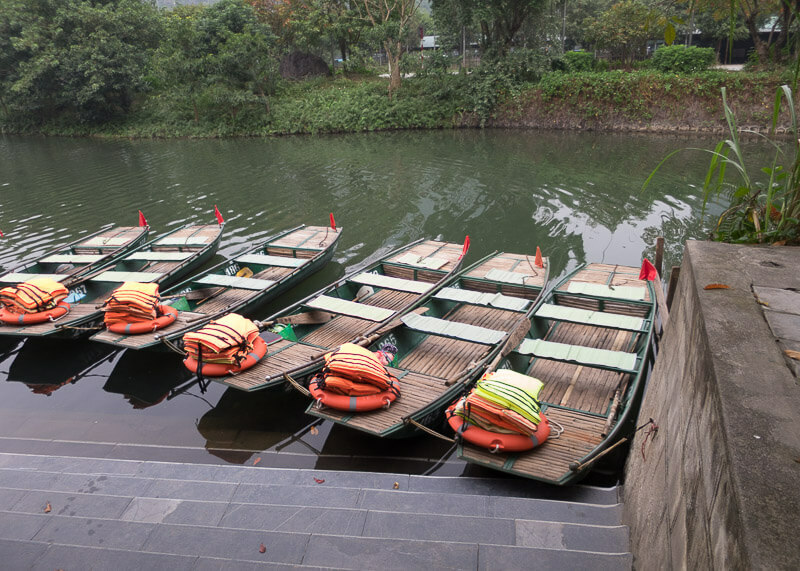 One of the main attractions in Ninh Binh is the boat rides. 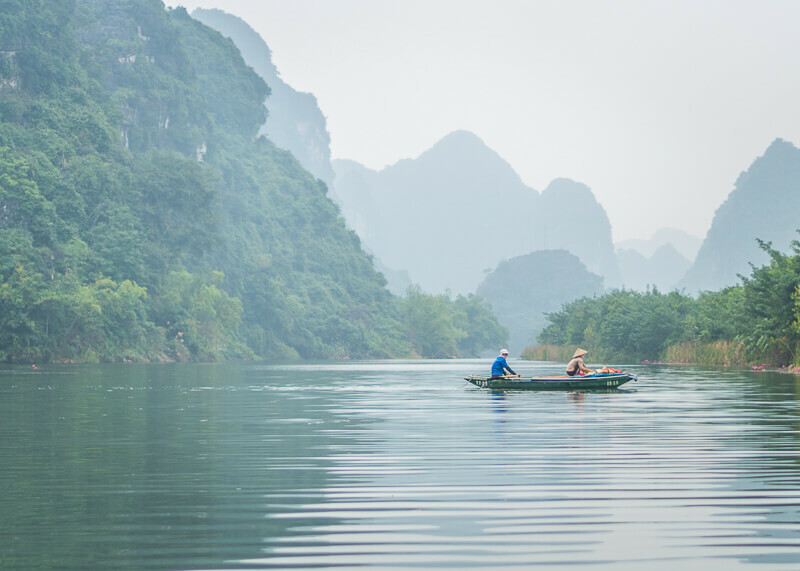 While foreign tourists flock towards Tam Coc, the Trang An grottoes boat tour is the one where you will have a better experience. Which boat tour should I choose? 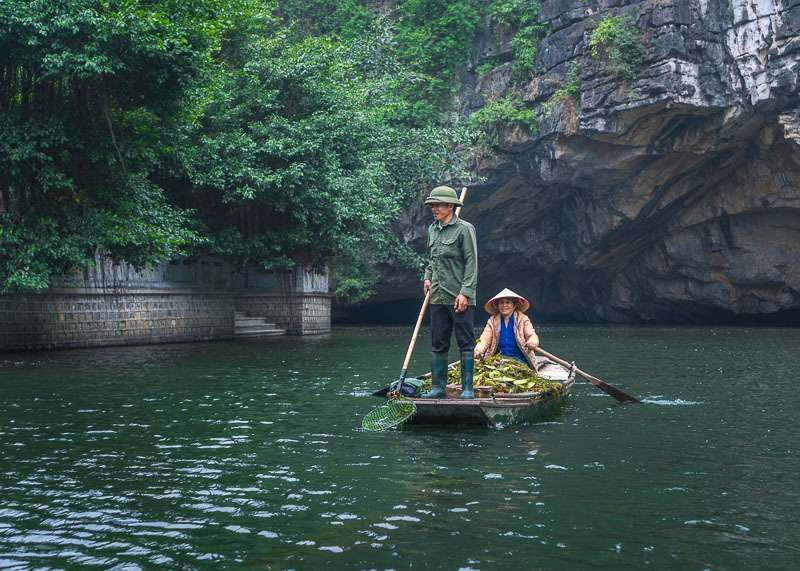 Trang An Grottoes Tour or Tam Coc boat tour? 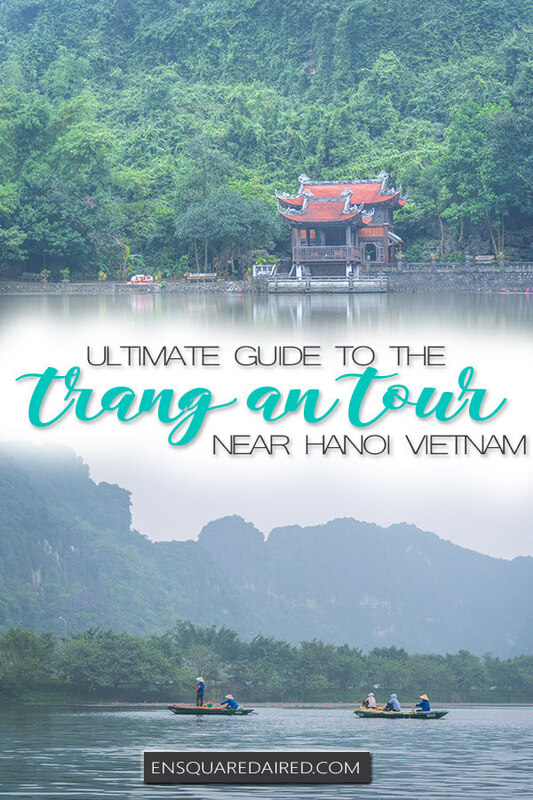 If you are reading this page, you’ve likely figured out that Trang An grottoes boat tour trumps the Tam Coc one. 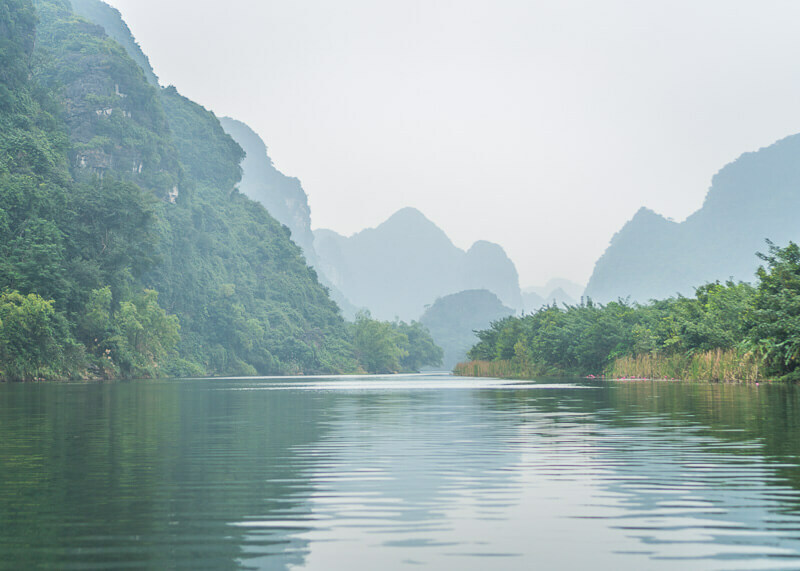 People say that Tam Coc is more beautiful, but when I look at the photos, I feel as if both boat tours look similar to me. 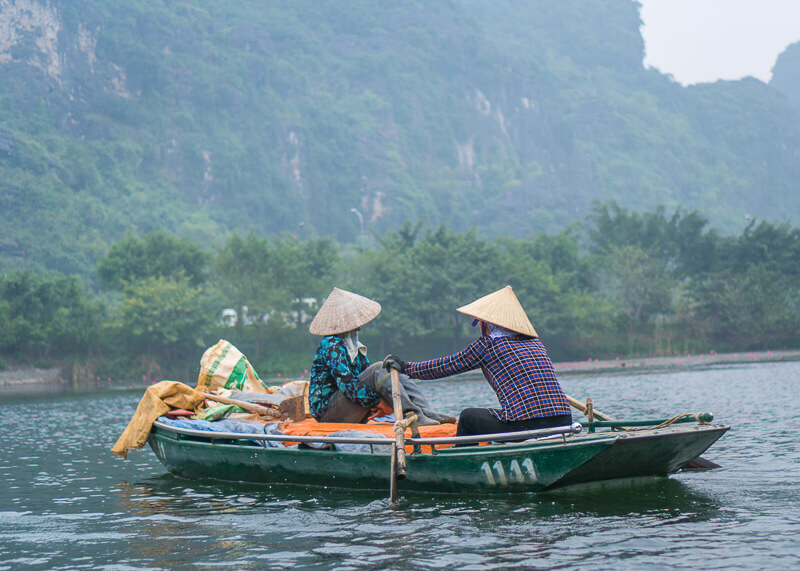 You will see more rice fields during the Tam Coc boat tour though. The most significant difference between the two is the service. 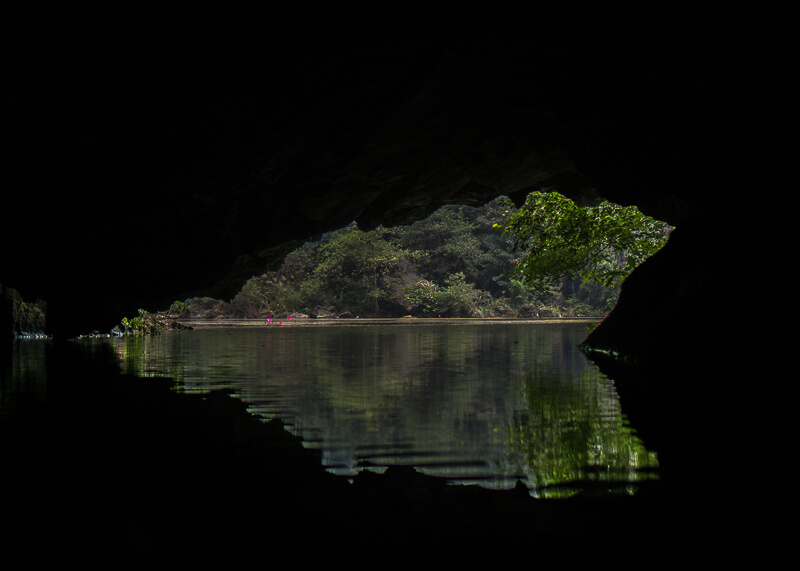 Since the Trang An grotto boat tour is managed by one company, customer service is regulated and consistent. Compare that to Tam Coc, where you will find hundreds of reviews online about the forced tipping at the end of the boat tour. The tipping piece isn’t the issue because that extra money goes a long way for the locals. However, it is the manner in how the tipping is forced upon you that ruins the experience. 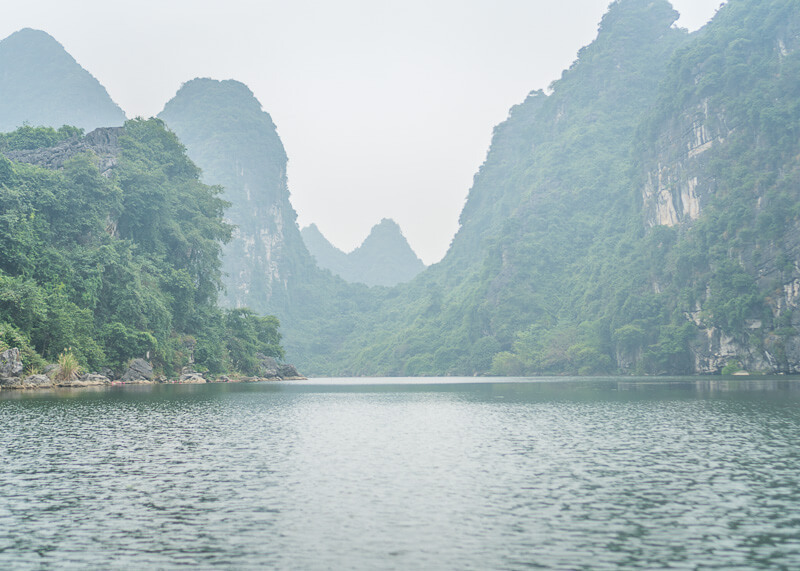 The Trang An grottoes boat tour is incredible. 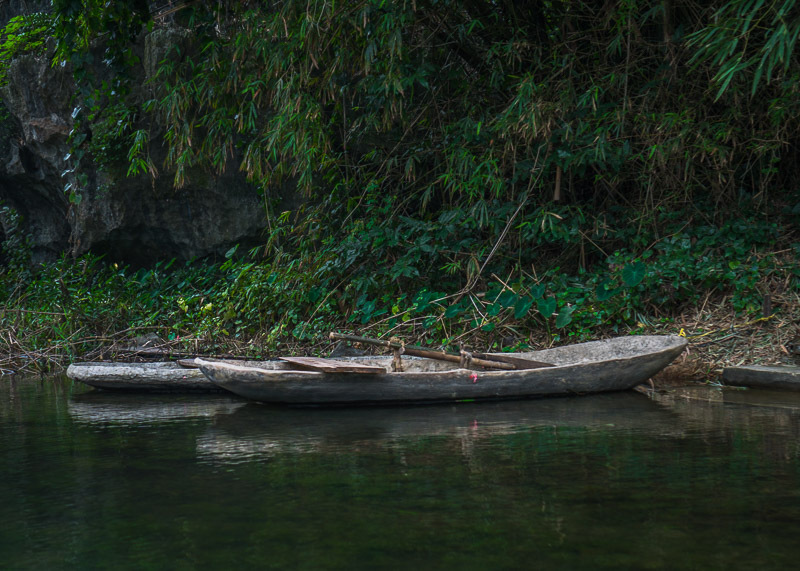 A Vietnamese woman will likely be paddling your boat for three hours. 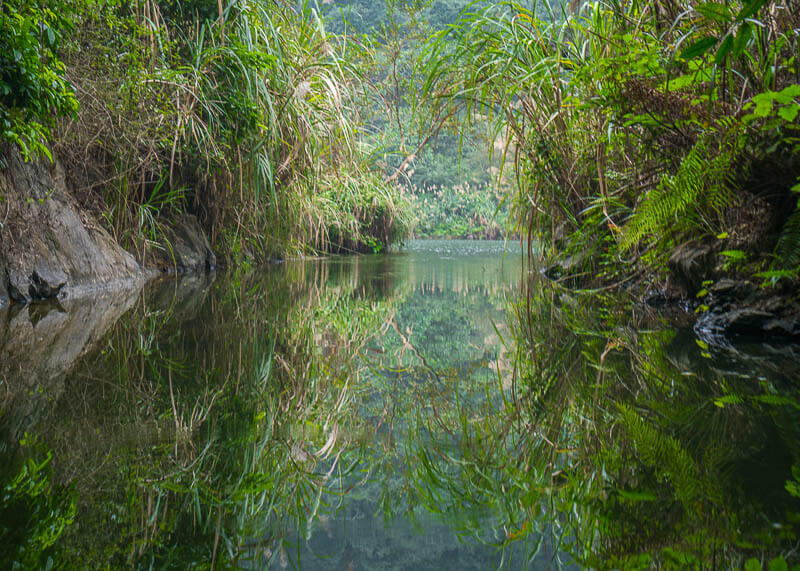 During this journey, you will get a glimpse of three temples, 31 valleys and some of over 600 kinds of flora in the area. Trang An grottoes boats try to have four passengers per boat (not including the rowing lady). That means that if you go early in the morning or late in the afternoon when there are fewer tourists, you will have to wait a bit. 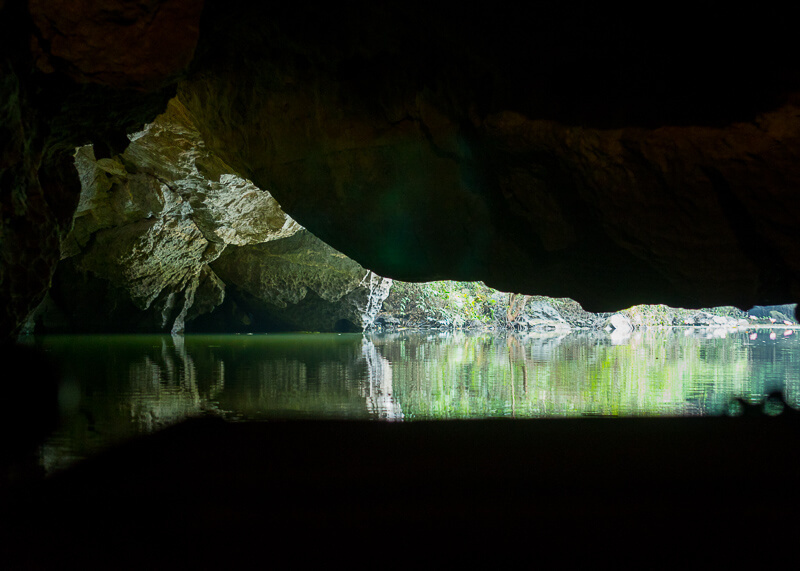 Yet, being able to experience Trang An grottoes at a peaceful time is so worth the wait. There are moments when you will see nothing but the reflection of mountains from the water. You might also find it to be a bit misty in the morning, making the trip feel all the more magical. We timed the Trang An grottoes boat tour so that we were the first ones on the water. We checked for opening times at 8 am and arrived there the moment the gate opened its doors. Make sure to check opening times with your hotel or online as opening hours may vary. 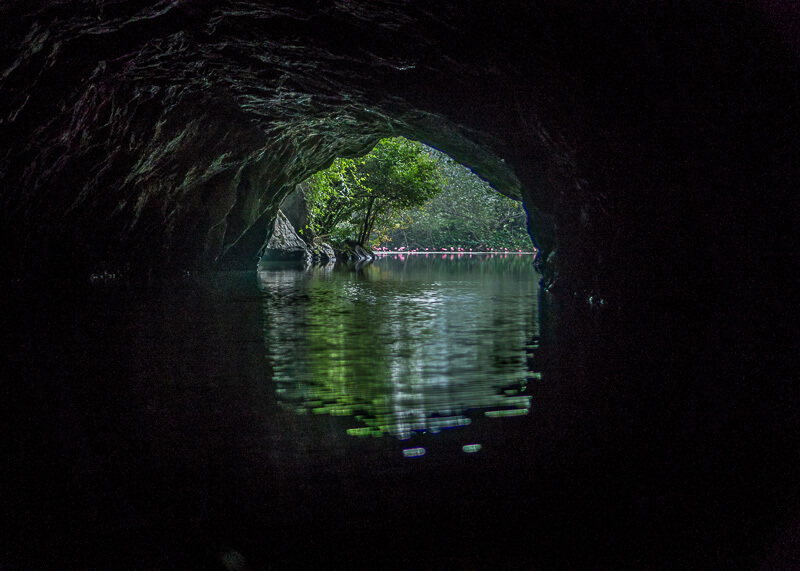 The experience was so incredible – we were utterly alone, floating down the Trang An grottoes. Feeling ultra peaceful was an understatement. 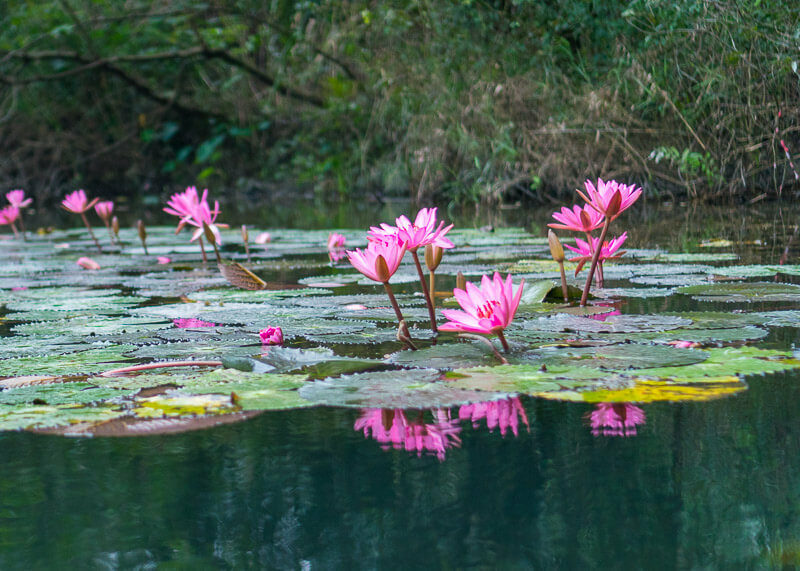 As we cruised along limestone mountains and rowed through lotus flowers, I could help but feel so in awe of Ninh Binh’s beauty. 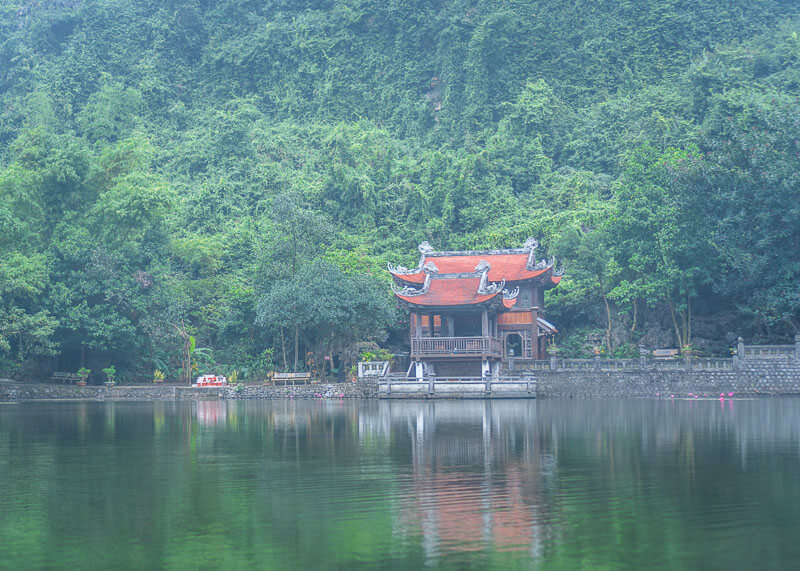 What I didn’t know about the Trang An grottoes boat tour is the number of temples you can stop by along the way. 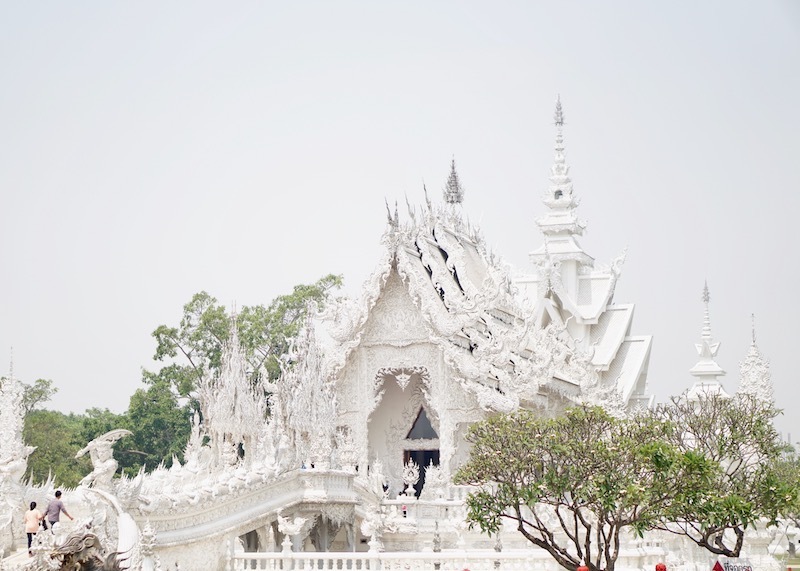 In fact, one of the temples was only accessible by boat. The rowing lady asked us if we wanted to stop at the temple. We decided to pass and admire the temples from afar, considering how our boat ride was three hours not including the temple stops. The first few caves were fun to see and explore. But by the end of the tour, we had visited a total of nine caves, which took a total of three hours to finish. Needless to say, I was “caved out” by the end of the tour, and our butts were super sore. The full tour usually has 12 caves that you’re supposed to pass through. But to be honest, anything more than three is overkill. There were many moments where we had to lie on our backs or duck because the gap between the water and the cave was so low. Apparently, you could choose two routes, but I don’t remember picking. 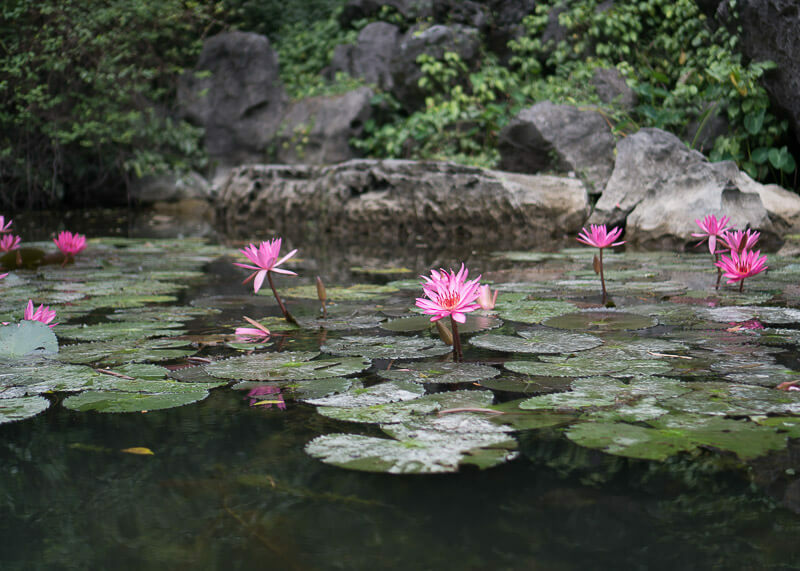 We saw ducks and natural lotus growing outside. What’s interesting is that there was a bunch of earthen pots in the middle of a cave in one of the Tran An grottoes. I wish I could tell you what they meant, but I couldn’t understand the boat lady’s accent. We read online all the horrible reviews about how the rowers will stop the boat in the middle of the lake and not row back until customers tipped them. Or, they were forced to buy pop at a high price and give them to the rower. That was not our experience at all. The lady was nice, quiet and rowed with incredible strength. The four of us felt bad for her, so we took turns helping her row throughout the trip. There was also no pressure to tip and none of the scams you may have read online. While the lady didn’t ask for a tip, we still gave her 50,000 VND anyways. The other two people on our boat were from Saigon so that I understand them when they spoke in Vietnamese. However, I struggled to understand whenever the rower was talking because of her Northern accent. It was interesting to hear the conversations between the two parties because, as you may know, North and South Vietnam are different. The Vietnamese lady told us (well, the Vietnamese couple) that there were over 2,000 boats. Yet, she only gets to row once a week during the slow season and usually one ride per day during busy season. The Vietnamese couple then joked about how she could go home and rest for the day, but unfortunately, things don’t work that way. Even though she likely won’t have any other customers for the rest of the day, she still has to go back and wait in the queue. I suppose it’s a precaution in case there are more customers during the day? Did I feel safe during the Trang An Grottoes Tour? I felt very safe, despite being in open waters and being the only foreigners on the boat. 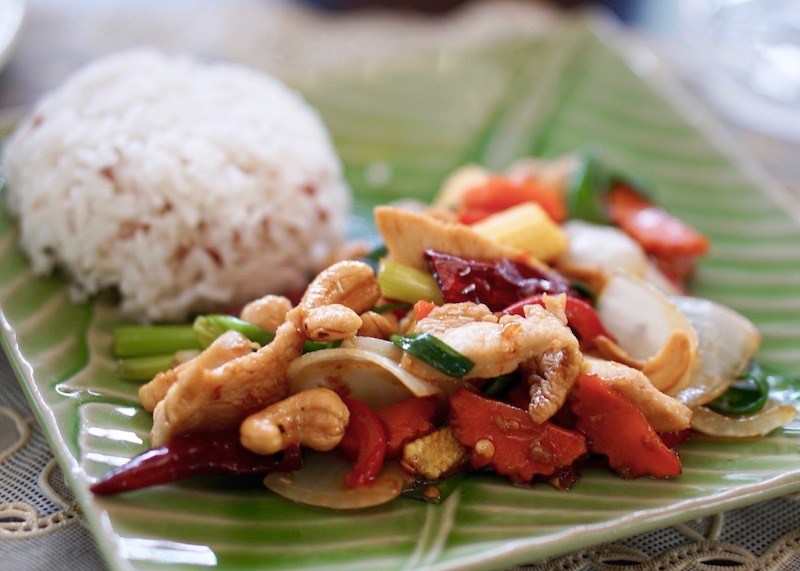 What kind of food should you bring during the Trang An Grottoes Tour? I brought snacks but barely touched any throughout the ride. I’d suggest bringing some dry snacks if you think you’ll get hungry during the two-three hour ride. Was it hard to find food during the Trang An Grottoes Tour? There is no food during the tour because you know, you’re on the water. 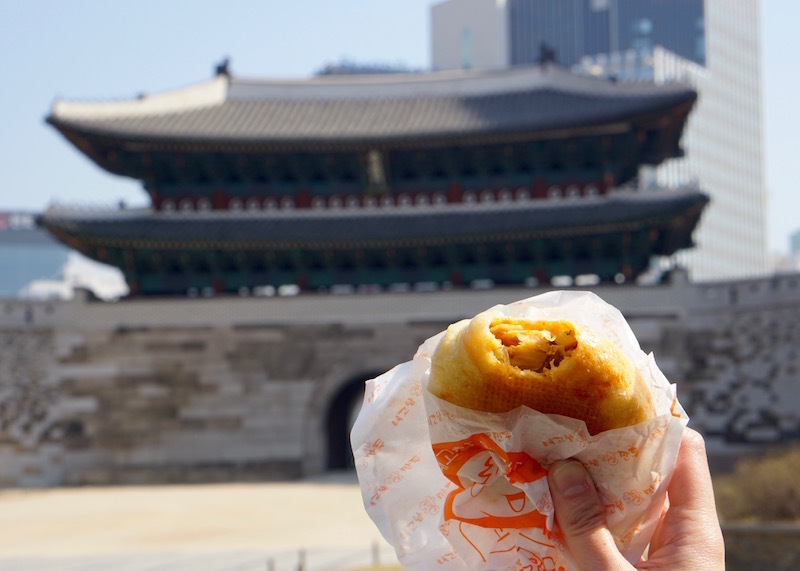 The tour runs from two to three hours so bring some snacks in case you are snackish. There is food to buy once you are back on land. 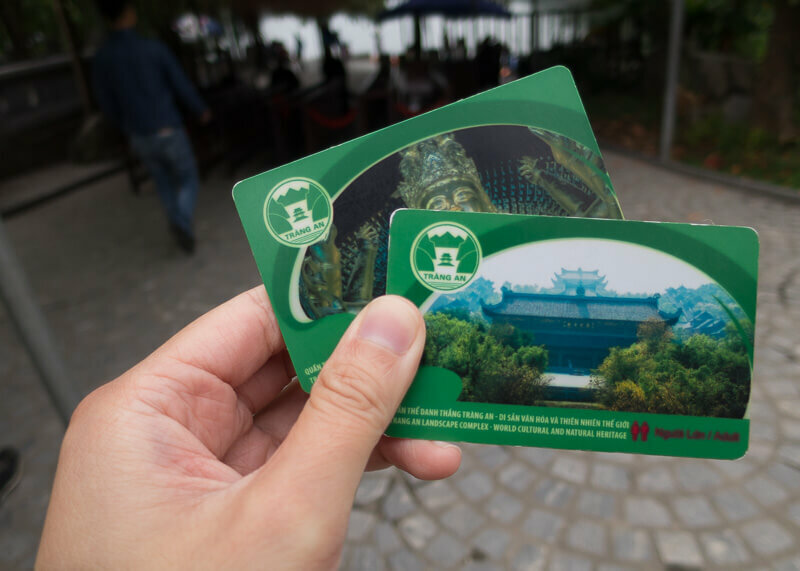 How much did it cost to go on the Trang An Grottoes Tour? What to wear and what to bring on the Trang An Grottoes Tour? Wear layers and make sure to bring a waterproof bag for your belongings. When you’re on a boat, there’s always a chance that your belongings could get wet or you could drop things into the water. Bring sunscreen and a hat if you go during the daytime when it is extremely hot! The bathrooms are clean in the area. Make sure to go before you hop on the boat. As always, bring toilet paper just in case. 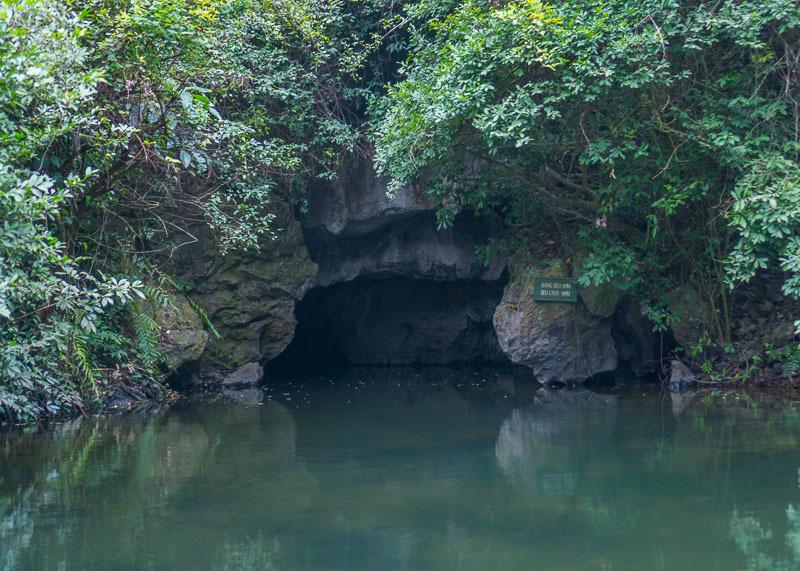 What’s the best time to go on the Trang An Grottoes Tour? I recommend going early in the morning or late in the evening. Where did I stay when I took the Trang An Grottoes Tour? 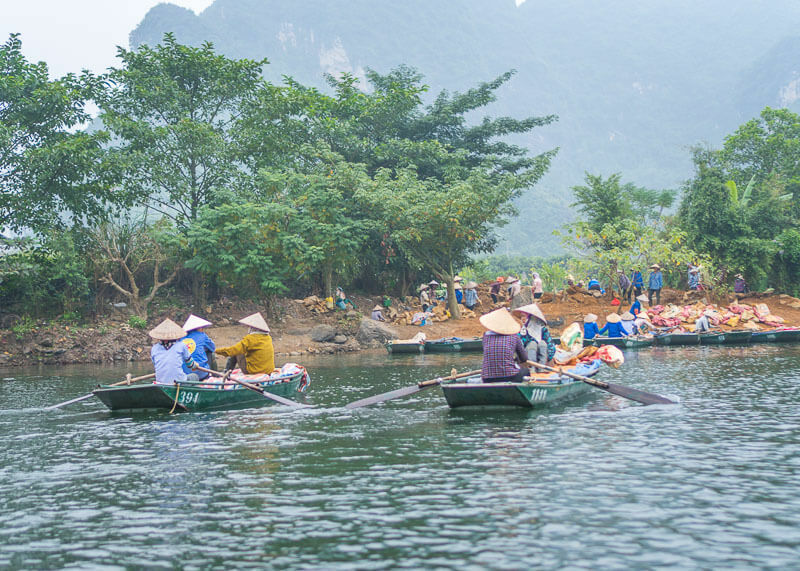 Don’t travel during Vietnamese holidays as it will get crazy busy! Consider visiting during the autumn or winter as it is less busy. 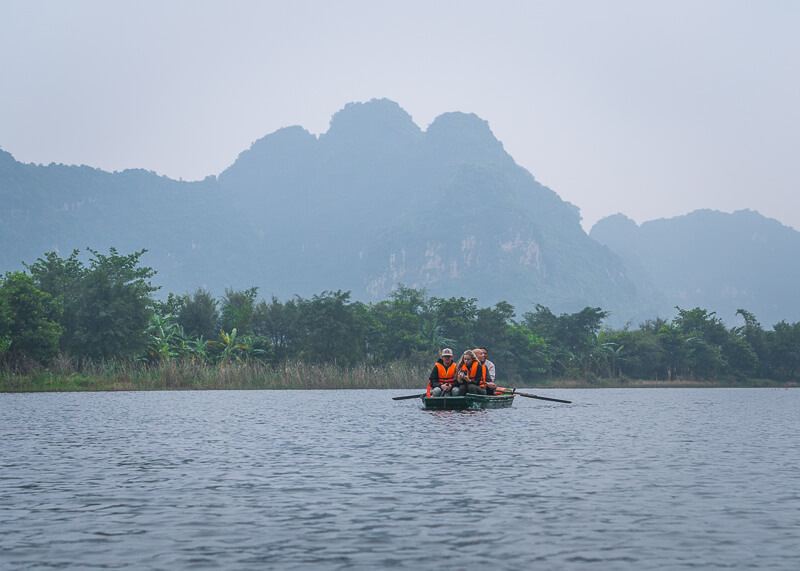 It’s just too cold for local travellers to visit Ninh Binh! Read all my Vietnam posts here.